The origin and exact recipe of Europe’s first alcohol-based perfume are obscure, but the essence known as ‘Hungary Water’ most definitely featured rosemary. It seems likely that this 14th century concoction was devised as a response to the Black Death that ravaged Europe from 1346 – 1350, as punters were advised to not only wear it as perfume, but also to bathe in it, and drink it. As well as it’s well known anti-microbial properties, rosemary steeped water was used as a facial wash by the Queens of Hungary to reduce the ravages of age, and a rinse of rosemary tea will reduce and reverse that affliction known as greying of the hair in many instances. Regular culinary doses have a positive effect on memory and cognitive function, as Shakespeare’s Ophelia confirms: “There’s rosemary, that’s for remembrance” (Hamlet, act 4, scene 5), and this quality is traditionally extended to include remembrance or fidelity in love. On the other hand, we often have to travel a ways in the modern world before finding someone who loves the horseradish. This hot but humble root however is enjoying something of a renaissance of late, and there is good reason for that. The glucosinolates in cruciferous vegetables are known to increase human resistance to cancer formation and proliferation, and the horseradish root is 10 times more potent than broccoli in this respect. On top of that, Russian researchers have discovered that horseradish extract has the ability to protect us from the mutagenic effects of environmental toxins. As a general antioxidant, horseradish is impressive too, strengthening the immune system, supercharging production and activity of white blood cells, and delivering a high dose of vitamin C to assist the body’s action against free radicals. Antibiotic compounds in horseradish concentrate in the urine, making this root a useful aid in the treatment of urinary tract infections. It also contains enzymes that prevent toxins accumulating in the bladder, and its stimulating action on blood capillaries is a useful adjunct for resolving issues of water retention and erectile dysfunction. Horseradish is a good source of folate, B6, niacin, sodium, magnesium, potassium and zinc, and is used internally and as a poultice to treat respiratory tract infections and ailments. But whatever you do, don’t feed it to your horse – it doesn’t sit well with them. 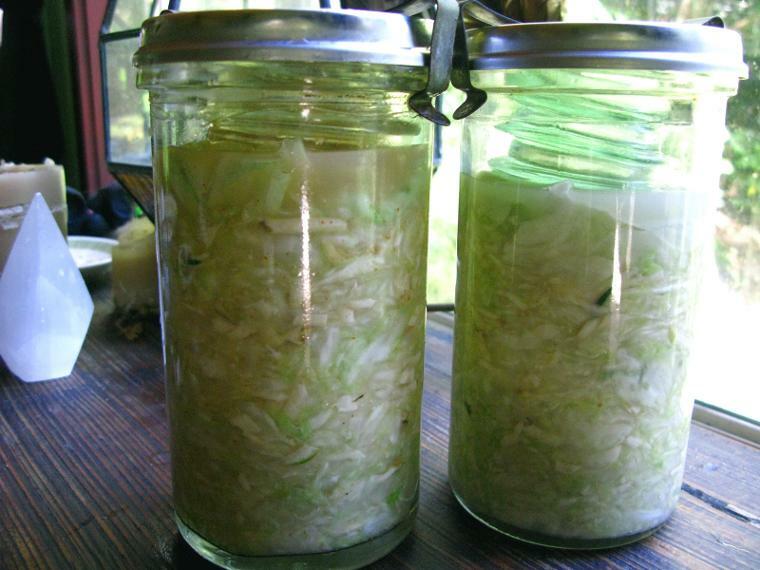 The usual sauerkraut making process follows – massage the salt into the ingredients well until a handful lifted triumphantly into the air and squeezed results in a good expression of brine. Pack into your crock orjars, and leave in anaerobic conditions for 6 weeks minimum. 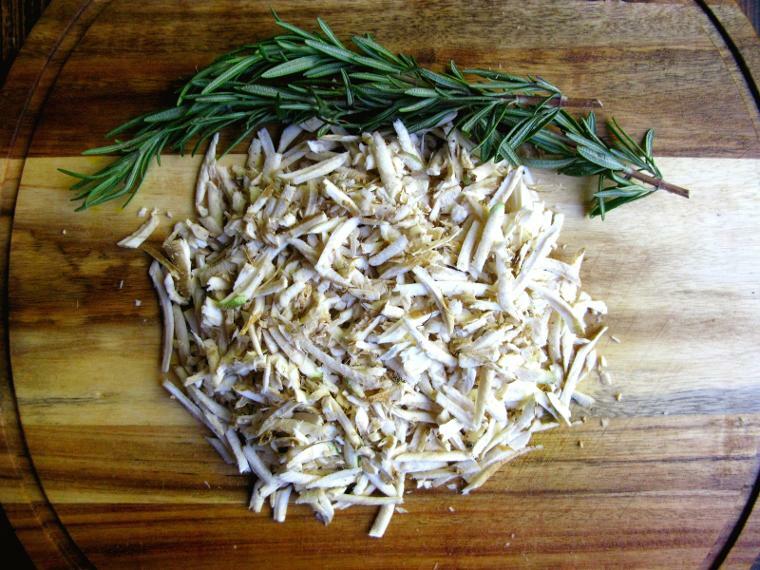 The resulting kraut will have a good strong bite, will help clear congestion, will give you a greater protection against cancer than plain kraut, and will assist general bodily health through elevated antioxidant activity, potent natural antimicrobial action, and the natural synergy of rosemary and horseradish.